Infections of the central nervous system (CNS) are an important cause of morbidity and mortality in immunocompetent hosts. Common etiologies include bacterial, viral, and parasitic infections, some of which are ubiquitous, while others primarily occur within endemic regions. Clinical presentations vary based upon the age of the patient and nature of the infection. Imaging manifestations mirror the portions of the brain which are affected, whether it be the brain parenchyma or its overlying protective meningeal coverings. At times, the imaging patterns suggest the causative agent. Knowledge of the common imaging patterns and potential complications of CNS infections is critical in prompt and accurate diagnosis and treatment, which will in turn minimize adverse outcomes. Meningitis refers to inflammation involving the protective meningeal coverings of the brain. It is the most common form of CNS infection. Most cases result from hematogenous spread of an infection from a distant site. Other etiologies include direct spread from sinonasal or mastoid infections, extension of cortical abscesses, postsurgical complications, or penetrating trauma. The infectious and inflammatory exudates infiltrate and spread along the meninges and perivascular spaces. The responsible organisms and clinical presentations vary based upon the age of the patient. Viral infections are more common than bacterial; however, bacterial infections are more prone to serious illness and complications. Meningitis remains a clinical diagnosis with confirmation by lumbar puncture. 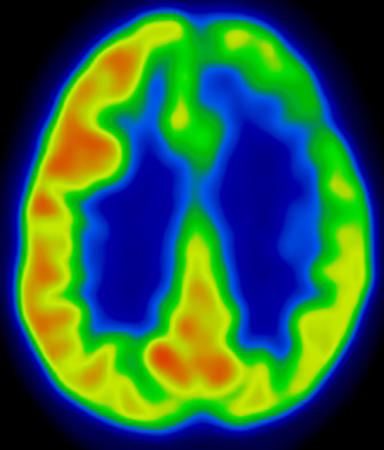 Imaging is generally reserved for cases in which the diagnosis is unclear, to evaluate for potential complications, or if the patient experiences clinical deterioration, seizures, or focal neurological deficits. In neonates, meningitis is most often acquired during childbirth or as a result of chorioamnionitis. There is an increased risk with prematurity and prolonged rupture of membranes. Group B Streptococcus, Escherichia coli, and Listeria monocytogenes are the most common organisms. Clinical presentation is nonspecific, often resulting in irritability, sepsis, and occasionally seizures. In older children and adults, Streptococcus pneumoniae, Haemophilus influenza, and Neisseria meningitidis are the most common organisms. Neisseria is especially prevalent in dormitory settings. Fever, headache, and nuchal rigidity are the most common clinical presentations in these patients. 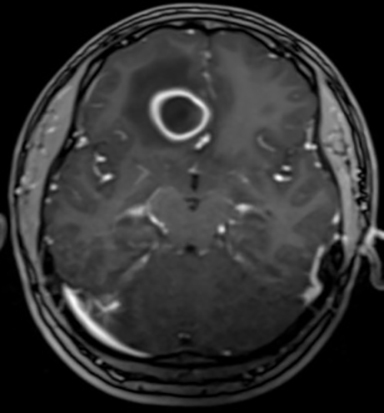 Imaging in the setting of uncomplicated meningitis is most often normal. 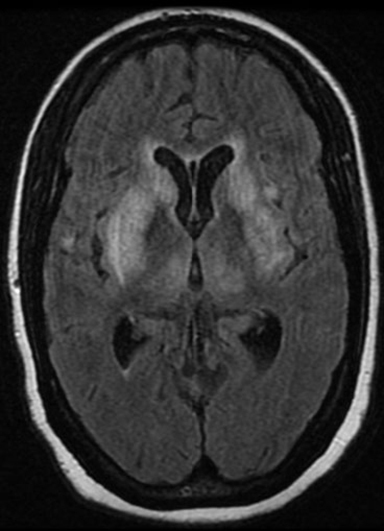 Magnetic resonance imaging (MRI) is more sensitive than computed tomography (CT) in evaluating for meningeal disease.1 Early in the disease process, MRI may show increased FLAIR signal intensity within the subarachnoid space2 (Fig. 1) with or without abnormal meningeal enhancement. Leptomeningeal enhancement (Fig. 2) may be smooth or nodular and is more common than pachymeningeal (dural) enhancement (Fig. 3). In general, most bacterial infections involve the cerebral convexities, while atypical infections (Mycobacterium tuberculosis and fungal infections) preferentially involve the skull base and basal cisterns. 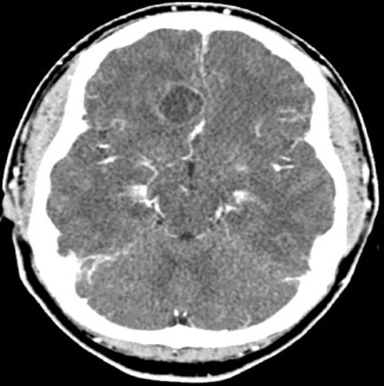 Complications of meningitis include hydrocephalus, ventriculitis, venous thrombosis, subdural empyema, and extension into the underlying brain parenchyma with cerebritis or abscess formation.3 Hydrocephalus can be categorized as communicating (extraventricular obstructive hydrocephalus) or noncommunicating (intraventricular obstructive hydrocephalus). Communicating hydrocephalus is more common and results from inflammatory exudates interfering with resorption of cerebrospinal fluid (CSF) at the arachnoid villi. 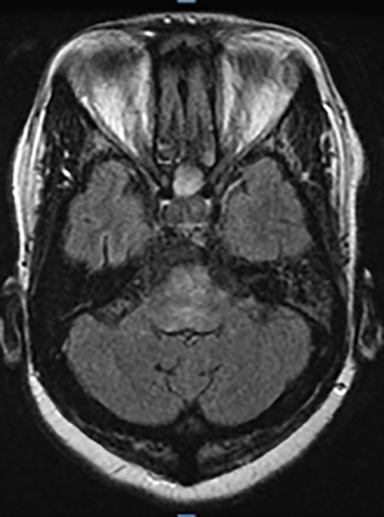 Noncommunicating hydrocephalus may occur at the cerebral aqueduct or fourth ventricular outlet foramina as a result of inflammatory webs or adhesions. Acute, uncompensated hydrocephalus results in increased intraventricular pressure with associated transependymal flow of CSF, which manifests as a rind of increased T2/FLAIR signal intensity along the margins of the lateral ventricles (Fig. 4). Cerebritis refers to focal infection of the brain parenchyma due to spread of infectious and inflammatory cells hematogenously or directly through perivascular spaces. With direct spread, the infection is often focal, while hematogenous spread often results in multifocal regions of parenchymal involvement. 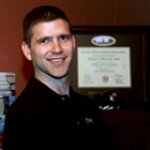 Patients typically present with seizures and/or focal neurological deficits, in addition to headaches. The treatment of cerebritis includes supportive care and intravenous antibiotics. 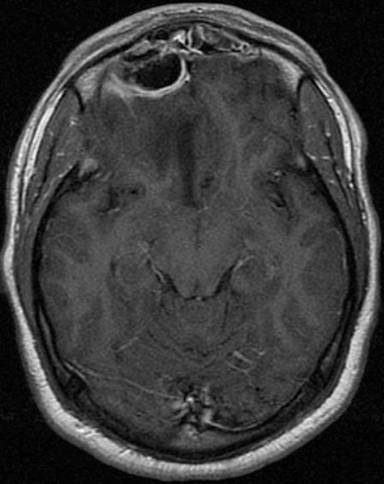 If left untreated or if resistant to appropriate therapy, cerebritis may progress to a focal brain abscess. The imaging findings of the stages of evolution from cerebritis to abscess are detailed in the following section. Brain abscesses may result from hematogenous spread of a systemic infection, direct spread from an adjacent infection, progression of a focal region of cerebritis, or as the result of direct inoculation from trauma or surgery. Depending upon the etiology, abscesses may be solitary or multiple. The vast majority of abscesses are pyogenic with the remaining being atypical infections, which are more common in immunosuppressed patients. There are four stages of abscess formation:6 early cerebritis (1-3 days), late cerebritis (4-9 days), early capsule formation (10-13 days), and late capsule formation (14 days and beyond). As discussed in the previous section, early cerebritis presents as an ill-defined region of hypoattenuation on CT or increased T2 and decreased T1 signal intensity on MRI. There may be patchy enhancement without clear margins. Restricted diffusion may be seen. In the late cerebritis phase, the region of attenuation or signal abnormality becomes more focal with thin linear rim enhancement, which does not imply capsule formation at this stage. As the infectious process progresses through the early and late fibrous capsule formation stages (10 days and beyond), there is increased thick rim enhancement with surrounding vasogenic edema. The enhancing fibrous capsule is low in T2 signal intensity and is thinner towards the ventricles. Prominent central restricted diffusion is characteristic of a pyogenic infection. The surrounding vasogenic edema is more pronounced in the late capsule phase. Fig. 6 illustrates the imaging progression from cerebritis to abscess formation. In the cerebritis phases, intravenous antibiotics may be sufficient for treatment. Once the fibrous capsule forms, surgical drainage is often required. Epidural abscesses are most often due to direct spread from paranasal sinus or mastoid infections. They may also occur as a result of adjacent calvarial processes, such as osteomyelitis or postsurgical complications.7 As with other epidural collections, epidural abscesses are lenticular in shape, confined by sutures, and may cross midline. On CT, epidural abscesses are hypodense on CT and may have air-fluid levels. The abscess cavity demonstrates rim enhancement; enhancement of the underlying dura may also be seen (Fig 7a). Similar findings are noted on MRI where the epidural collections are hypointense on T1 and hyperintense on T2 sequences with similar enhancement patterns compared to CT (Fig. 7b and c).8 The presence of restricted diffusion is variable but typically seen. Treatment of epidural abscesses includes a combination of antibiotic therapy and surgical drainage. If left untreated, epidural abscesses may result in venous sinus thrombosis or extend through the dura to involve the subdural space, leptomeninges, or brain parenchyma. Subdural empyemas most often result as a complication of meningitis or from direct spread of sinonasal or mastoid infections. As with other subdural processes, subdural empyemas are crescent-shaped, may cross sutures and extend along the interhemispheric fissure, but do not cross midline. On CT, subdural empyemas are hypodense and typically have enhancement of the adjacent meninges.9 Similar findings are noted on MRI with decreased T1 and increased T2 signal intensity, along with associated meningeal enhancement (Fig. 8).8 As a general rule, subdural empyemas demonstrate restricted diffusion, while sterile subdural effusions do not. 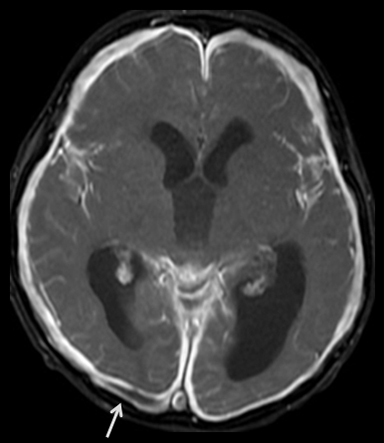 Effusions are commonly seen with Haemophilus influenza meningitis. Treatment of subdural empyemas includes surgical drainage with antibiotic therapy. 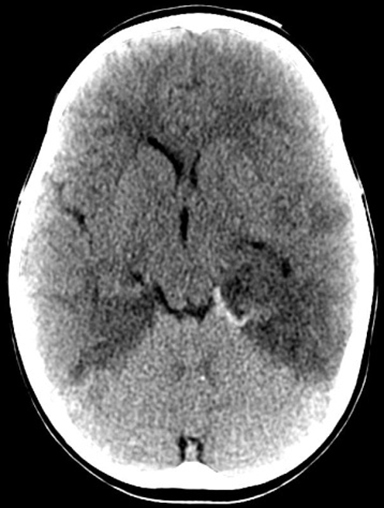 Complications include hydrocephalus, venous sinus thrombosis, and extension into the adjacent meninges and brain parenchyma. There are numerous causes of viral encephalitis. The most common organisms which affect immunocompetent hosts include herpes simplex virus (HSV)-1 and those associated with mosquito- borne illnesses, such as West Nile, Eastern equine, and Japanese viral encephalitis. 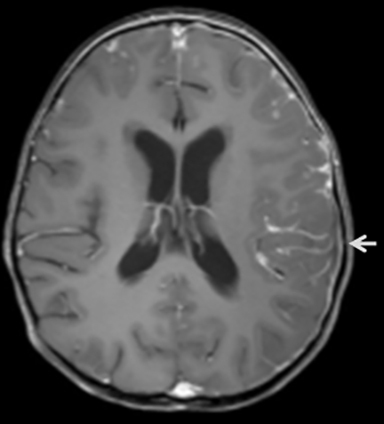 HSV-1 is the most common cause of viral encephalitis, accounting for over 90% of cases. The viral infection may be primary or due to reactivation of a latent orofacial virus within the trigeminal ganglion, which is more common. HSV-1 encephalitis may occur in both immunocompetent and immunosuppressed individuals, although the morbidity and mortality is much higher in those who are immunosuppressed. Patients present acutely with fever, headache, seizures, mental status changes, and focal neurological deficits. If not recognized and treated promptly, the mortality rate approaches 70%.10 Even with treatment, there is significant morbidity and mortality amongst affected patients; over half of patients whom survive have permanent neurological sequelae. Imaging findings correspond to the site of reactivation within the limbic system. CT and MRI reveal regions of cortical and subcortical edema involving the temporal lobes, inferior frontal lobes, insula, and cingulate gyrus (Fig. 9). Most cases demonstrate bilateral but asymmetric involvement. 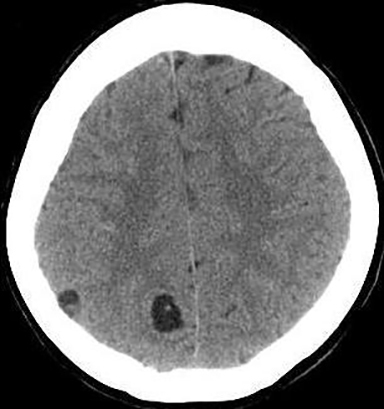 The pattern of edema is in a nonvascular distribution, which is helpful in discriminating from an acute arterial infarct, and typically spares the deep gray matter. 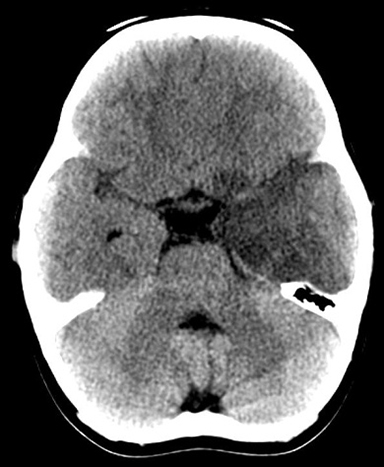 Foci of hemorrhage are commonly seen on CT. Patchy enhancement and regions of restricted diffusion are typically seen. Patients are treated with antiviral medications and supportive therapy. 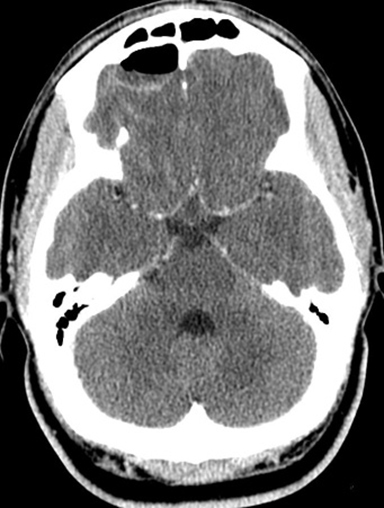 Complications include progression of the infection, venous sinus thrombosis, and intraparenchymal hemorrhage. Non-HSV viral encephalitides include West Nile, Eastern equine, and Japanese encephalitis, which are mosquito-borne illnesses prone to endemic regions. Patients present acutely with influenza-like symptoms, which then progress to meningitis or encephalitis with significant motor deficits. Flaccid paralysis and death occur in severe cases. CT and MRI may be normal early in the disease process. 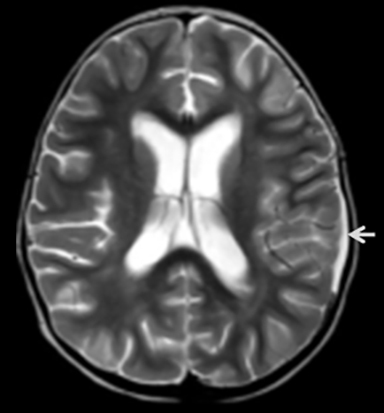 As the disease progresses, focal regions of parenchymal signal abnormality are commonly seen. 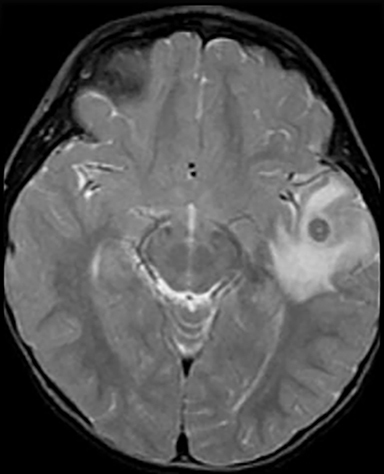 Parenchymal abnormalities include symmetric bilateral regions of hypodensity (CT) and signal abnormality (MRI) involving the thalami, lentiform nuclei, caudate, mesial temporal lobes, and brainstem (Fig. 10).11-14 Patchy enhancement and foci of hemorrhage may be seen. Overlying meningeal enhancement is relatively uncommon but is occasionally seen. Treatment consists predominantly of supportive care, as there currently are no effective antiviral therapies. 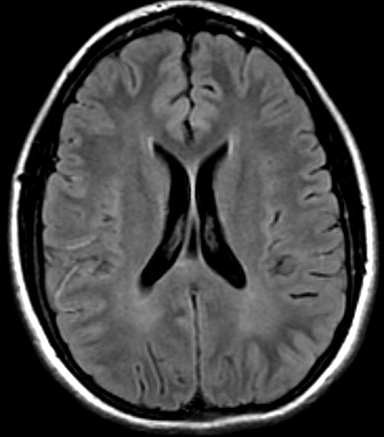 Rasmussen encephalitis is a rare progressive inflammatory neurological disorder of unknown origin. A viral or post-viral autoimmune etiology has been postulated, although the pathophysiology remains unclear. Patients present in childhood with persistent, relentless focal motor seizures (epilepsia partialis continua). As the disease progresses, patients experience hemiplegia and varying degrees of cognitive deficits. The disease process affects one cerebral hemisphere and results in progressive inflammation and atrophy. 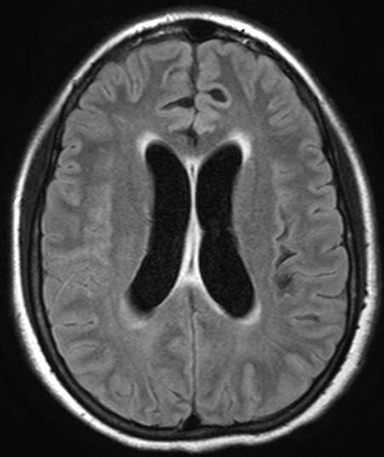 Early on, MRI demonstrates abnormal edema and increased T2 signal intensity within the involved cerebral hemisphere. Chronically, findings are more characteristic with abnormal signal, asymmetric atrophy, and decreased perfusion and metabolism on the affected side (Fig. 11).15,16 Treatment consists of functional hemispherectomy to prevent spread of the inflammatory process to the contralateral side. Neurocysticercosis is a parasitic infection that results from ingestion of undercooked pork or contaminated fruits and vegetables. It is the most common acquired cause of epilepsy worldwide. The causative organism is Taenia solium, a pork tapeworm. The disease is most prevalent in Central and South America where it is endemic. Those that frequently travel to these regions are susceptible to contracting the disease. The ingested ova develop into larvae which become lodged within the musculoskeletal and central nervous systems. 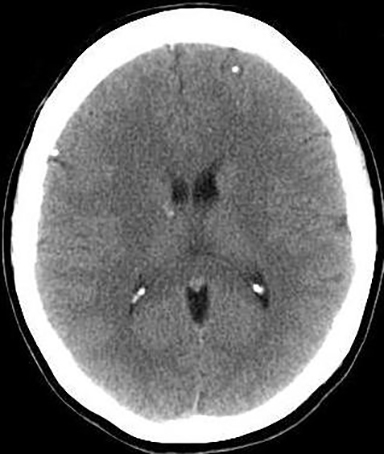 Within the CNS, lesions most often occur at the gray-white junction, followed by the ventricular system and subarachnoid spaces (racemose form). Patients often present acutely with seizures and headaches. In summary, there are various etiologies of CNS infections which affect the immunocompetent host. Clinical presentations vary based upon the age of the patient and nature of the infection. Knowledge of the characteristic imaging patterns and potential complications of various infectious processes will allow for prompt diagnose and treatment, thus minimizing morbidity and mortality associated with these entities. Chang KH, Han MH, Roh JK, et al. Gd-DTPA-enhanced MR imaging of the brain in patients with meningitis: comparison with CT. Am J Neuroradiol 11: 69-76, 1990. Stuckey SL, Goh TD, Heffernan T, et al. Hyperintensity in the subarachnoid space on FLAIR MRI. Am J Roentgenol 189: 913- 21, 2007. Hughes DC, Raghavan A, Mordekar SR, et al. 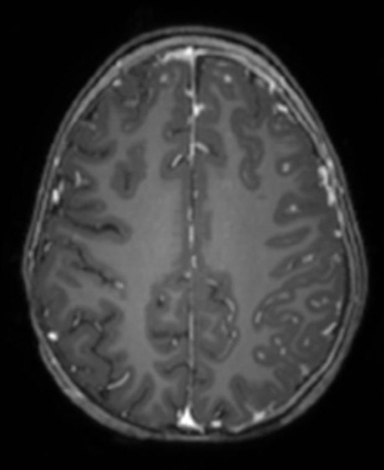 Role of imaging in the diagnosis of acute bacterial meningitis and its complications. Postgrad Med J 86: 478-85, 2010. Falcone S, Post M. Encephalitis, cerebritis, and brain abscess: pathophysiology and imaging findings. Neuroimaging Clin N Am 10: 333-53, 2000. Tung GA, Rogg JM. 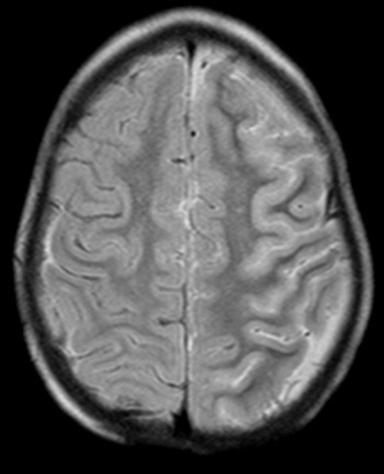 Diffusion-weighted imaging of cerebritis. Am J Neuroradiol 24: 1110-13, 2003. Hygino da Cruz LC, Domingues RC. Intracranial infections. In: Atlas SW. Magnetic resonance imaging of the brain and spine, 4th ed. Philadelphia, PA: Lippincott Williams & Wilkins, 2008. Weingarten K, Zimmerman RD, Becker RD, et al. Subdural and epidural empyemas: MR imaging. Am J Roentgenol 152: 615-21, 1989. 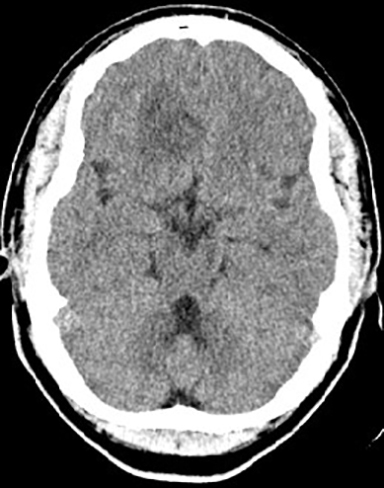 Weisberg L. Subdural empyemas: clinical and computed tomographic correlations. Arch Neurol 43: 497-500, 1986. Ahmad N, Ray CG, Drew WL. Herpesvirus. In: Ryan KJ, Ray CG, Ahmad N, et al. Sherris Medical microbiology, 5th ed. New York, NY: McGraw-Hill, 2010. Petropoulou KA, Gordon SM, Prayson RA, et al. 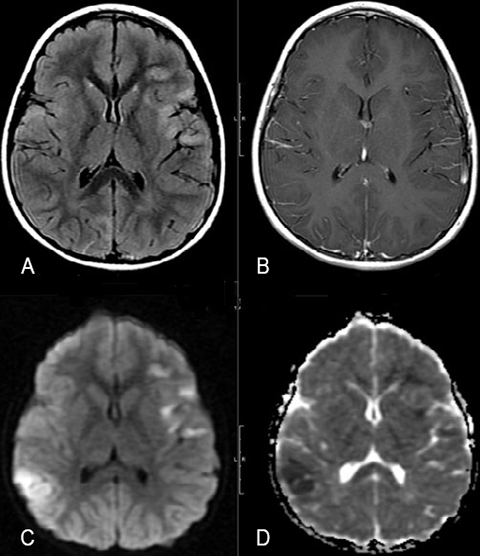 West Nile virus meningoencephalitis: MR imaging findings. 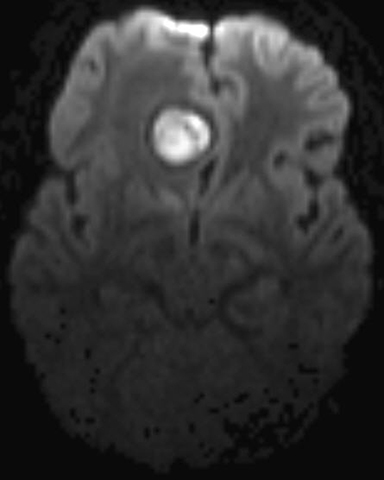 Am J Neuroradiol 26: 1986-95, 2005. Abe T, Kojima K, Shoji H, et al. Japanese encephalitis. J Magn Reson Imaging 8: 755-61, 1998. Kumar S, Misra UK, Kalita J, et al. 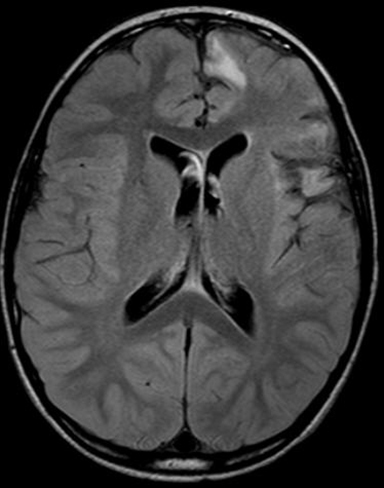 MRI in Japanese encephalitis. Neuroradiology 39: 180-4, 1997. Siu JCW, Chan CY, Wong YC, et al. Magnetic resonance imaging findings of Japanese encephalitis. J HK Coll Radiol 7: 76- 80, 2004. Geller E, Faerber EN, Legido A, et al. 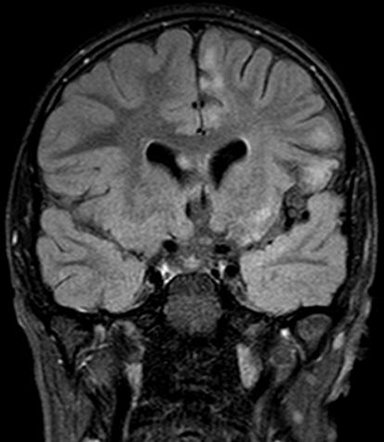 Rasmussen encephalitis: complementary role of multitechnique neuroimaging. Am J Neuroradiol 19: 445-9, 1998. Fiorella DJ, Provenzale JM, Coleman RE, et al. 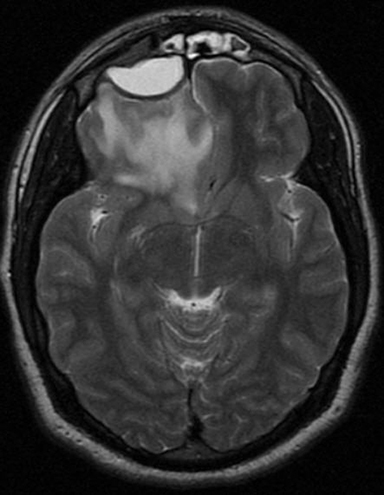 18F- Fluorodeoxyglucose positron emission tomography and MR imaging findings in Rasmussen encephalitis. Am J Neuroradiol 22: 1291-99, 2001. O'Brien WT Sr. Imaging of CNS Infections in Immunocompetent Hosts. J Am Osteopath Coll Radiol. 2012;1(1):3-9.